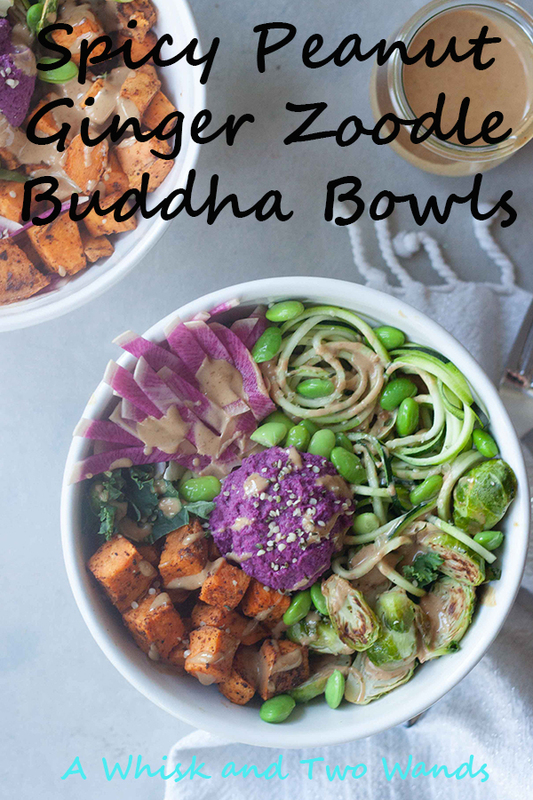 Spicy Peanut Ginger Zoodle Buddha Bowls may seem like a mouthful to say but really there is a mouthful of flavor in every bite! 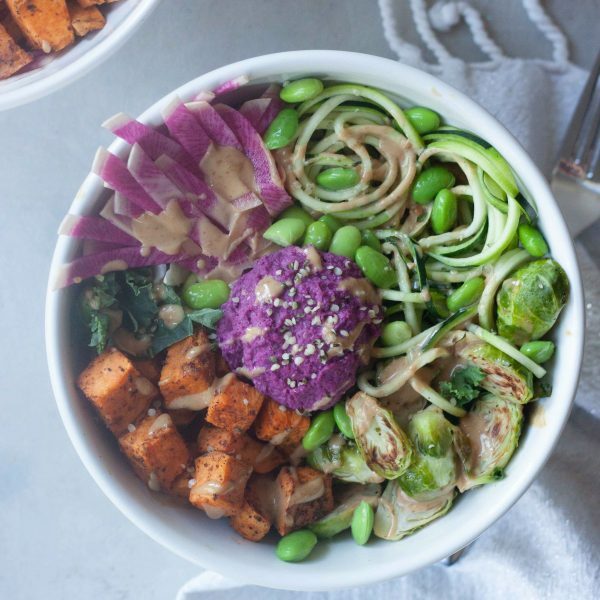 A cross between a zoodle bowl and a flavor and nutrition packed buddha bowl! I don’t even know where to start with this bowl there is so much in it! Zoodles, chipotle roasted sweet potatoes, roasted brussels sprouts, kale mix, edamame, hemp seeds, a probiotic beet hummus, and a Peanut Ginger Sauce! Oh my yum! 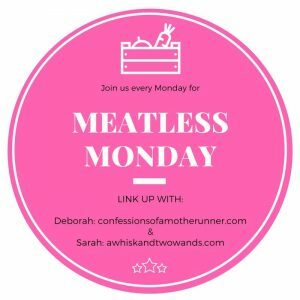 Before you start worrying about all the ingredients trust this busy mom it’s easier than you think and it will make other meals during the week easier! Inspired by a Power Inspired by a protein plate I had at a local restaurant for lunch that I had on my list to recreate and one day had leftover sweet potatoes and brussels sprouts I had roasted. The potatoes weren’t season, it was good but not the same. So I batch cooked and prepped more veggies this time seasoning and with plans to make this bowl and another recipes I cannot wait to share. Or if you get to the weekend and have leftover roasted brussels sprouts to use up make a Roasted Brussels Sprouts Neapolitan Pizza! The Peanut Ginger Sauce keeps a few days so I will make that and the beet hummus right before we enjoy these bowls and enjoy the leftovers for lunch or again on other bowls or salads. You can also use store bought beet hummus or just blend in cooked beets, or I like to use Farmhouse Culture Ginger Beets, into plain hummus if you don’t have time to whip together the recipe below. 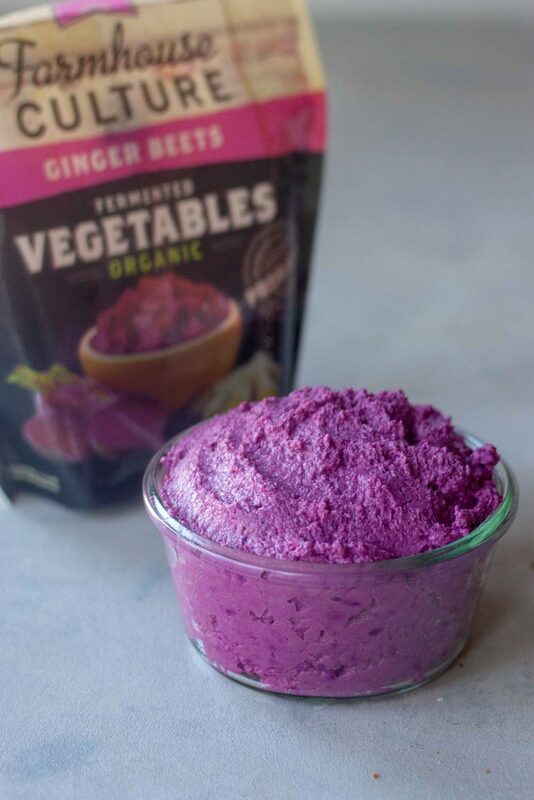 My Purple Probiotic Ginger Beet Hummus below uses Farmhouse Culture Ginger Beets for added probiotics, and Iove the purple color, or I have a Beet Hummus recipe posted years ago you can use. When it comes to throwing the bowls together it takes less than 10 minutes, or about 20 if I have to make the Peanut Ginger Sauce and Beet Hummus. Just zoodle the zucchini (is zoodling a thing?) and throw everything together in a bowl! 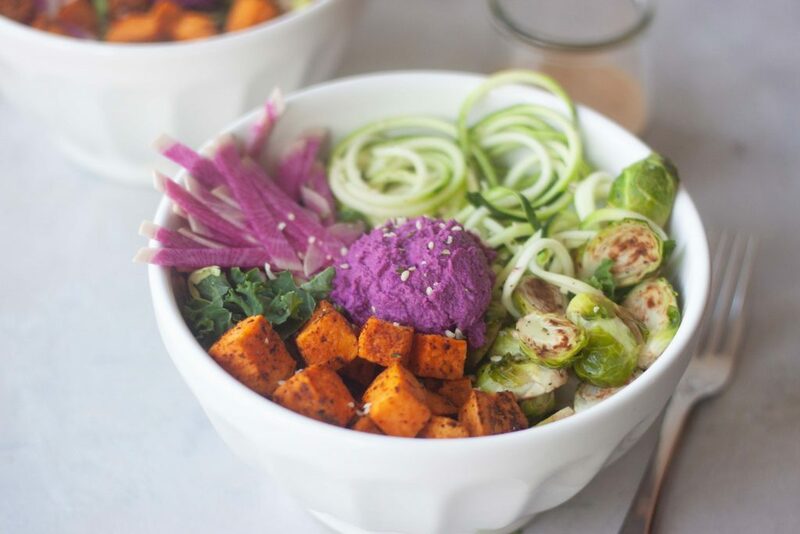 Healthy lunch or dinner this bowl is packed with carbs, plant-based protein, and whole food nutrition! Not to mention flavor. Customize bowls to your tastes so if you don’t like beets or hummus leave it off. Not a fan of or don’t have hemp seeds you can swap those for pumpkin or sesame seeds or just omit them. That’s the best thing about these and if you have other things in the fridge to use up add those in too. 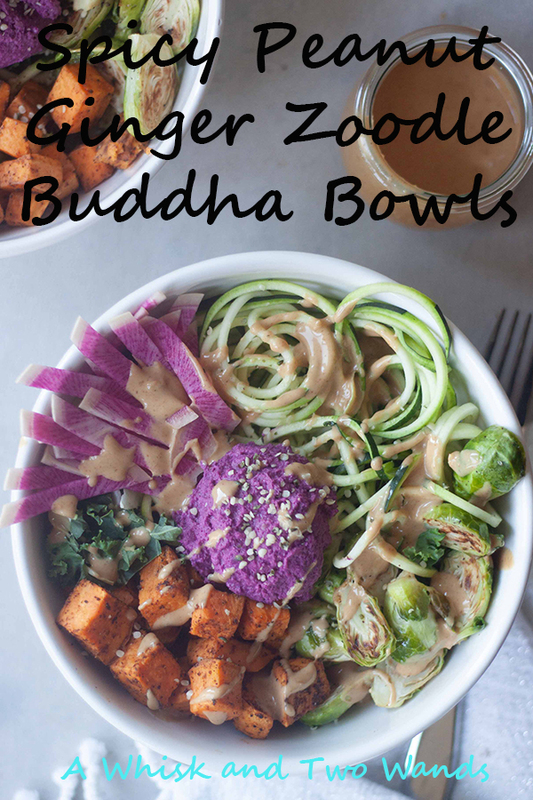 Spicy Peanut Ginger Zoodle Buddha Bowls just happen to be perfect for Meatless Monday too! If only we weren’t leaving in a few days and trying to clean out the fridge these would be dinner tonight. Instead they’ll be one of the first things I make when we get back. A great way to get your family to eat more veggies and maybe try new things. I look forward to seeing what’s happening in your kitchen and hope you link up with me and my co-host Deborah. I also hope you check out and are inspired by the recipes linked up below. 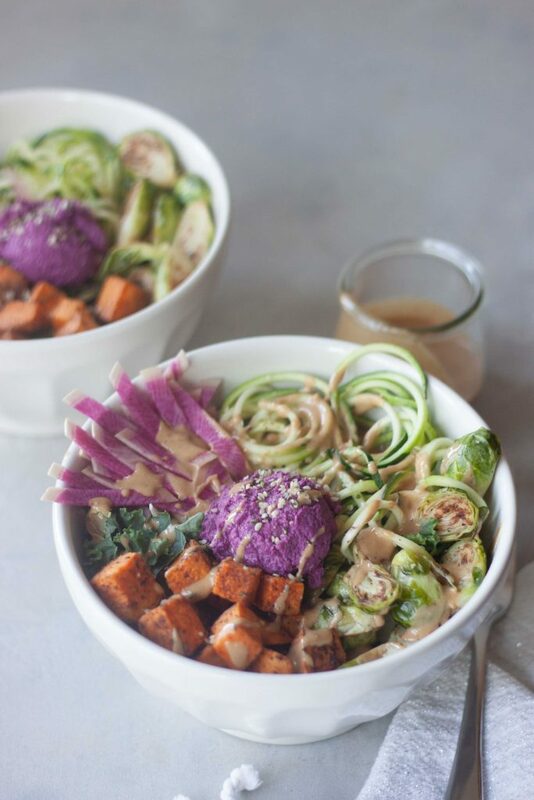 Spicy Peanut Ginger Zoodle Buddha Bowls a flavor, plant-protein, and nutrition packed bowl of zucchini, chipotle roasted sweet potatoes, greens, optional edamame and more topped with probiotic beet hummus and a peanut ginger sauce. Easy to prep ahead for an easy weeknight dinner or lunch. Preheat oven to 400F. Line a rimmed baking sheet with foil and spray with coconut oil spray, or oil of choice. Peel 2-3 medium to large, or more for batch cooking, sweet potato and chop into cubes about the size of dice. Spread sweet potatoes on prepared baking sheet and spray with coconut oil spray. Alternatively you can toss with 1 tablespoon of coconut or avocado oil. Sprinkle with chipotle seasoning and toss. Use more or less depending on how many you're roasting up. Roast sweet potatoes for 20-25 minutes, tossing/flipping once half way, or until tender (will depend on size). Line a rimmed baking sheet with foil and spray with coconut oil spray, or oil of choice. Cut 1lb of brussels sprouts in half, or more for batch cooking. Spread brussels sprout halves on prepared baking sheet and spray with coconut oil spray. Alternatively you can toss with 1 tablespoon of coconut or avocado oil. Season with salt and pepper. Roast for about 30-40 minutes or until tender. Store roasted veggies in the refrigerator until you are ready to assemble bowls. 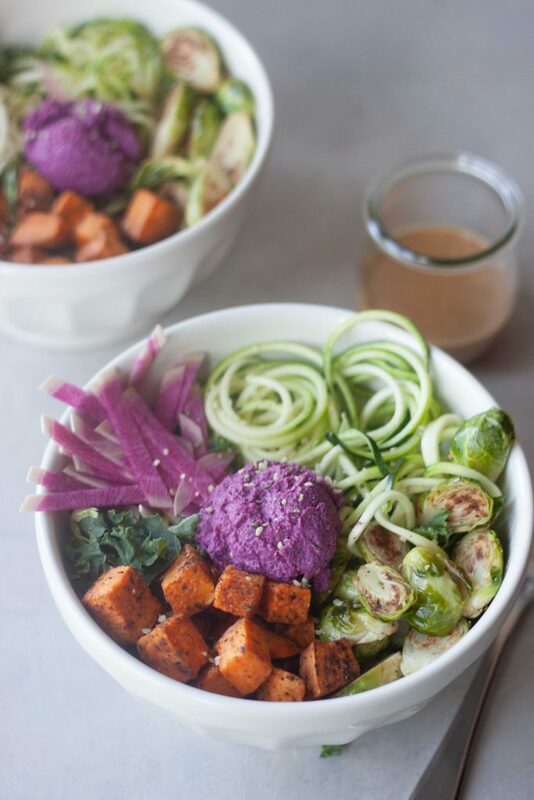 Bowls can be assembled with warm or cold roasted sweet potatoes and brussels sprouts. To make Peanut Ginger Sauce mix ingredients together until smooth adding hot water to thin to desired consistency. Store in the refrigerator until ready to use, it will slightly thicken, use within a week. To make Purple Probiotic Ginger Beet Hummus blend chickpeas, tahini, beets and a couple tablespoons of liquid, garlic, and juice of lemon in a food processor (I use a mini one) until smooth. Stream in oil and add additional liquid as desired to reach desired consistency. Season with sea to taste. Store in an airtight container in the refrigerator until ready to enjoy, use within a few days. To assemble bowls zoodle zucchini and press between paper towels to remove excess moisture. Divide zoodles between 4 bowls and add Sweet Kale Superfood Mix or baby kale. Top with chipotle roasted sweet potatoes, roasted brussels between bowls, edamame, optional watermelon radish, Purple Probiotic Ginger Beet Hummus, and hemp seeds. Drizzle or serve with Peanut Ginger Sauce. Enjoy! To make your own Chipotle Seasoning combine the following. Store in a glass jar as it will make about 1/2 a cup. 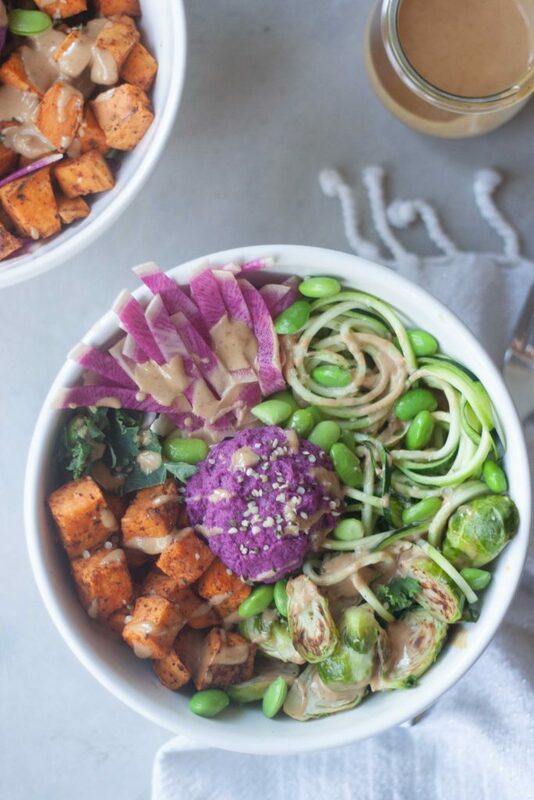 What a nutrient packed buddha bowl! I kind of eat versions of a buddha bowl most nights. Adding in your beet hummus would be delish! One of my go-tos too! Bowl meals are my favorite any time busy or not! I love all the flavors going on and I can tell you were to start, by shoveling this into my mouth! Have a great week! Haha, yes! I hope you have a great week as well! It’s so good and different from other beet hummus I’ve had or made in the past and the color was a bonus! Yum, this looks so good! I love the color on that beet hummus. Thank you! It’s unlike other beet hummus I’ve made or had and the purple color was a beautiful bonus! Wow! That is one beautiful buddah bowl. The beet hummus is amazing. Good lord this looks AMAZING! It looks delicious not to mention so pretty. I’m very curious to to taste how the purple probiotic ginger beet hummus tastes like. I can somewhat imagine it with all ingredients but can’t wait to try it. Thanks.